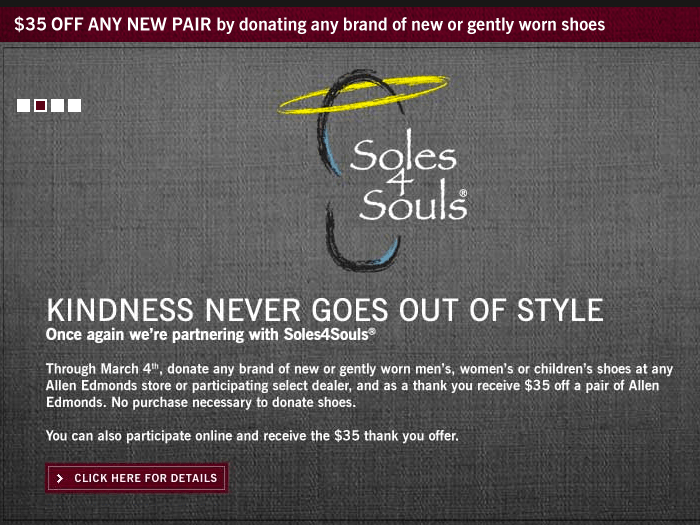 Men's footwear manufacturer Allen Edmonds will again partner with Soles4Souls to conduct a national shoe drive through March 4 to donate new and gently worn shoes to those in need. Joined by 100 retailers, Allen Edmonds will collect shoes donated by customers. As a thank you, customers receive an immediate $35 discount on a new pair of high-end Allen Edmonds shoes. Online consumers can enter the word “honor” in a promotion code box at checkout to apply the $35 thank you discount. Every shipment of Allen Edmonds shoes will contain a pre-paid shipping label and instructional card for the consumer to send back gently worn shoes directly to the Soles4Souls distribution facility. The shoe certain fits between brand and cause in this repeat cause-related marketing campaign. Consumers are incentivized by a product discount to participate in this very clear transactional campaign. We love the digital “honor code” component of this campaign, allowing people to take advantage of the discount online in advance of their donation and making it simple for consumers to fulfill their commitment by incorporating pre-paid shipping labels and instructions with each order. Looking for more examples of cause marketing campaigns? You'll find 2011 campaigns here and new 2012 campaigns here.